Issa Rae joins Marsai Martin and Regina Hall at the Little premiere on Monday night (April 8) at the Regency Village Theatre in Westwood, Calif. The ladies all looked super stylish as they premiered their new movie. Other stars at the premiere included Marsai‘s black-ish co-star Miles Brown, A Wrinkle in Time‘s Storm Reid, grown-ish‘s Francia Raisa, Bunk’d‘s Skai Jackson, and Grey’s Anatomy‘s Kelly McCreary. Little hits theaters on Friday, April 12. FYI: Issa is wearing a Balmain dress, Sam Edelman shoes, Harry Kotlar diamonds studs, and a Djula ring. Marsai is wearing a Pamella Roland gown. Regina is wearing a Ralph & Russo dress and Stuart Weitzman shoes. Storm is wearing a Missoni dress, Stuart Weitzman shoes, and Jennifer Meyer jewelry. Skai is wearing a Ronald van der Kemp dress, Sophia Webster sandals, and Effy jewels. Francia is wearing a Genny dress. 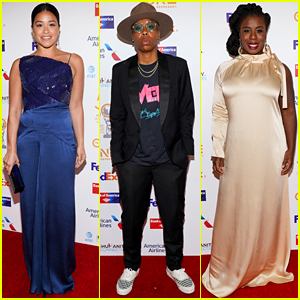 Gina Rodriguez, Lena Waithe, and Uzo Aduba hit the red carpet while attending the 2019 NAACP Image Awards’ Non-Televised Dinner on Friday (March 29) at the Beverly Hilton Hotel in Beverly Hills, Calif. Joining Gina at the event was her fiance Joe LoCicero! 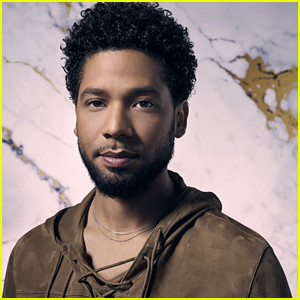 Also in attendance at the event were The Daily Show‘s Trevor Noah, Black-ish‘s Marsai Martin, Miles Brown, and Marcus Scribner, The Real‘s Tamera Mowry, Adrienne Bailon, and Loni Love, This Is Us‘ Lyric Ross and Lonnie Chavis, Us‘ Winston Duke, Rent Live‘s Brandon Victor Dixon, The Passage‘s Saniyya Sidney, Insecure‘s Jay Ellis, and director Boots Riley. Marsai won two awards – Best Performance by a Youth in a Series and Best Supporting Actress in a Comedy Series. Marcus picked up Best Supporting Actor in a Comedy Series. The Real won Outstanding Talk Series. FYI: Gina is wearing a Roland Mouret dress and a Lala Lexa clutch. Uzo is wearing a Rosetta Getty dress. Marsai is wearing a Bibhu Mohapatra dress and Nicholas Kirkwood shoes. Trevor is wearing a Dior blazer, Givenchy pants, and Saint Laurent shoes. Adrienne is wearing a Dress The Population jumpsuit. 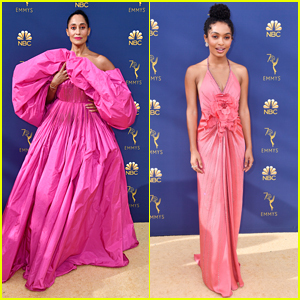 Tracee Ellis Ross definitely turned heads in her pink gown at the 2018 Emmy Awards held at the Microsoft Theater on Monday (September 17) in Los Angeles. 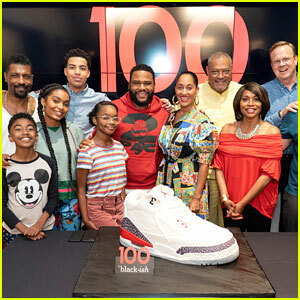 The black-ish actor was joined by co-stars Anthony Anderson, Deon Cole, Jenifer Lewis, Yara Shahidi, Marsai Martin, Miles Brown, and Marcus Scribner on the red carpet for the show. FYI: Tracee went all out with a vivid pink Valentino gown and Repossi jewelry. Jenifer wore all Nike. Marsai wore a Viktor and Rolf dress, Nicholas Kirkwood shoes and Marzook clutch. Yara wore Gucci with Forevermark Diamonds. Miles wore Emporio Armani. Marcus is wearing a ChineduStyle suit, Strong Suit shirt, Loriblu shoes, and Swarovski cufflinks. The cast of Black-ish is ringing in a major milestone! Anthony Anderson, Tracee Ellis Ross, and their co-stars celebrated the taping of the 100th episode with a cake-cutting ceremony on set at The Walt Disney Studios on Thursday (August 23) in Los Angeles. 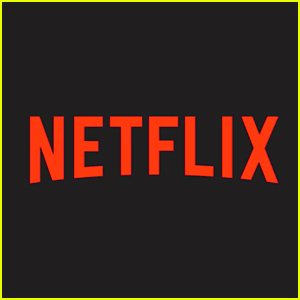 Deon Cole, Miles Brown, Yara Shahidi, Marcus Scribner, Marsai Martin, Laurence Fishburne, Jenifer Lewis, Peter Mackenzie, and Jeff Meacham were all in attendance. 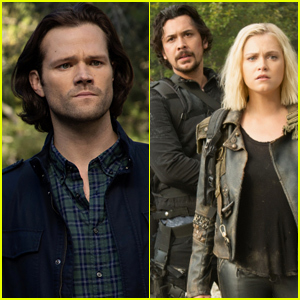 The 100th episode will air later this season. Season five of Black-ish premieres on October 16!